It's the little things that make me happy. 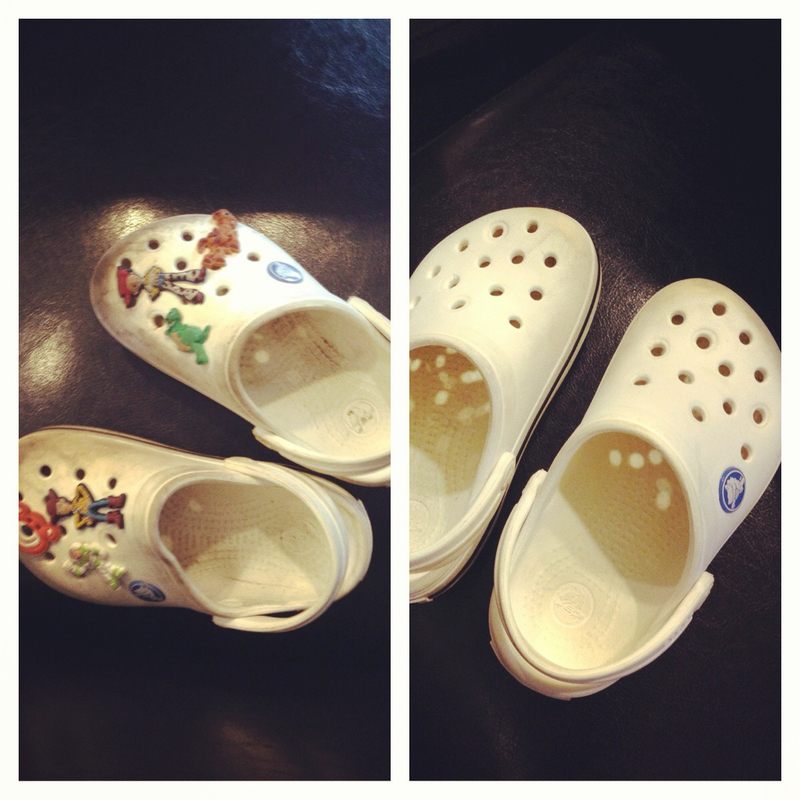 Like taking LO's old white crocs and repurposing them for her little brother. This may not sound like groundbreaking news worth blogging about, but I'm here to admit I have a habit of donating old/used stuff and buying NEW stuff All. The. Time. It's awful. Not that donating items to our local Goodwill or Salvation Army is bad, because it isn't and we typically have a huge lot of items that we donate every year (we prefer this route over garage sales). But sometimes I wish I didn't always have the "New is Better" mindset. It's something I'm aware of (finally) and I'm working on it. You just wait 'til little baby #3 arrives and you see him/her wearing everything his/her older brother and sister wore when they were little. Yes, I kept a lot of their clothes and shoes so there will be a lot more repurposing around here! As for the crocs, I've learned a valuable lesson: Don't buy white crocs. Ever. It was amazing how after just a few short weeks (days?) 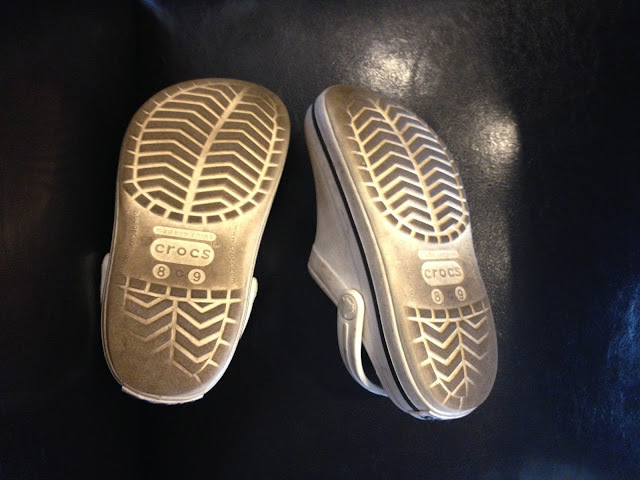 of wearing these crocs, LO managed to turn every surface pitch black. How in the world does that happen?? 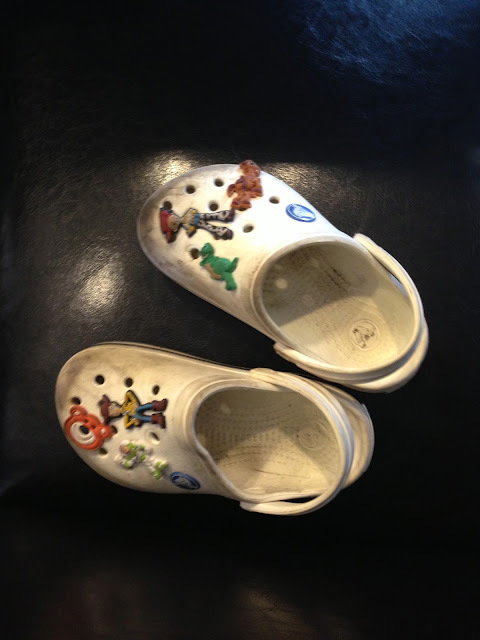 Granted she was a crazy-busy 3-year-old when she first started wearing them, and I'm pretty sure 3-year-olds don't put too much of a priority on keeping their shoes clean. Whatevs. I remember trying to clean them periodically but getting frustrated because it just didn't seem to help. Then she outgrew them and they've been sitting in a box for months (years?). I finally got them out on Sunday to start my deep cleaning attempt so they could be presentable enough to put Chase in. Here's how they looked when I started. They were awful. Not sure these pics really do them justice! The bottom was absolutely filthy and I didn't have much hope that they'd improve too much, but I wasn't too worried since the bottom would just get dirty again with use. 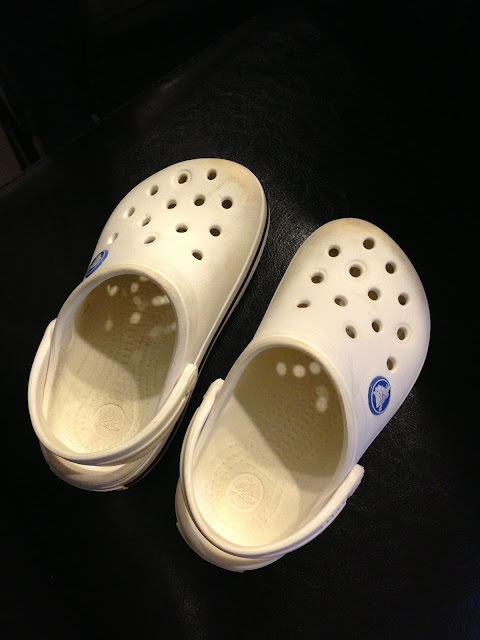 I started out by removing the jibbitz and soaking the crocs in hot, soapy water. I put them in a bucket with a few dessert plates on top of them to hold them down in the water. I had planned to soak them for about 5-6 hours. It ended up being over 24 hours. Ooops! After soaking them, I used a brush and scrubbed them like a crazy person. After a good rinse I let them dry, then applied crocs butter to them to help 'em shine. Here's the after pic! Now all we need is to slap some new jibbitz on these bad boys and they'll be ready for my little guy! Yay!